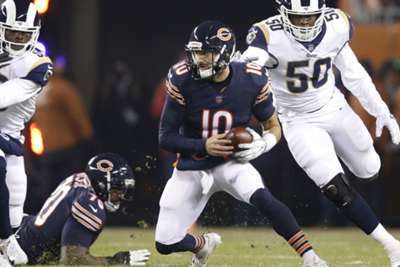 The Chicago Bears shut down Jared Goff and the high-flying Los Angeles Rams to win 15-6 in NFL action on Sunday. It was not the high-scoring affair we saw when the Rams faced the Kansas City Chiefs in a primetime showdown. In fact, it took three quarters for a team to score a touchdown. Instead, what we saw when Los Angeles travelled to Chicago to play the NFC North-leading Bears was a high-powered defense that completely shut down one of the NFL's best offenses. Chicago used a defense powered by Khalil Mack, Sherrick McManis — who had a season-best performance — and Prince Amukamara. The Bears also saw the return of quarterback Mitchell Trubisky, who missed the last two games with a shoulder injury. His second-half turn around helped engineer the game's only touchdown drive. They tackled, they sacked, they scored (a safety). The Bears defense certainly did it all. The Bears, who have held opponents to six-or-fewer first-half points in seven games this seasom, were able to keep the Rams, who entered the contest averaging 17.3 first-half points (third in the NFL), at bay. It was Los Angeles' lowest half-time point total of the season and the Rams were completely shut out in the second half. Chicago used the pass rush to pressure the young Goff, who was sacked three times, and a secondary that had four interceptions — to be fair, the Los Angeles defense also grabbed three picks. It was impossible to get anything done against this crew, especially with the breakout outing from McManis. McManis led the Bears with six total tackles, one tackle for a loss and one quarterback hit. Amukamara matched that with six combined tackles and an interception, and Mack made his presence felt more than once as he was one of eight other defenders to record multiple tackles. If you thought Trubisky would back off in his first game back after suffering an injury to his right shoulder, you were wrong. After all, he is the team's second-leading rusher and he used his feet to pick up yards early, testing his shoulder against a formidable Rams defense with the likes of Aaron Donald — who leads the league in sacks (16.5). Trubisky used two runs in the opening drive, including a 13-yard carry on third down, to set the Bears up near the 50-yard line, but an interception would end that drive. He turned to his receivers after that first drive and used short passes to move the Bears into field-goal range. He did throw three interceptions, but he did not need to throw it far to build a lead over Los Angeles. In the first touchdown of the game, Trubisky found offensive lineman, yes offensive lineman, Bradley Sowell for a short two-yard score. He was so fearless, in fact, that he tried the long ball again — it did not end well. Back-to-back interceptions! @iamjohnthethird picks Trubisky and Kyle Fuller takes it back on the next play! But, despite the interceptions, Trubisky looked good in his first game back since November 18. He finished 16-of-30 passing for 110 yards and one touchdown. Whether it was the cold in Chicago or the pressure from the Bears defense, the Rams had a problem establishing the run. Goff, who was not receiving much help from his offensive line, needed Todd Gurley II to help tire Chicago's defensive front. But, until the fourth quarter, Gurley had just six yards on six carries. This is the same Gurley who leads the NFL in rushing (1,175 yards). Gurley started to make an impact in the first drive of the final quarter, but was stopped ... again. He has now been held to fewer than 100 yards in two of the team's past three games. Ultimately, Los Angeles had to rely on Goff, who was also less effective. Goff finished 20-of-44 passing for 180 yards, no touchdowns and the four interceptions. He and running back Justin Davis both had one carry apiece, but the rest of the load was carried by Gurley. He finished with 28 of the team's 52 total rushing yards.